SOFIA, Bulgaria -- The European Union is hardening the tone to Ukraine in a moment when to the east of the country a new menace is emerging - another term of Vladimir Putin, who has won the presidential elections on March 4 and also gave clear signals for a tough course on strategically important issues. EU Enlargement and Neighbourhood Policy Commissioner Stefan Fule. In the last week the European pressure on Ukraine started to grow because of the extreme inaction of Kiev since the beginning of the year, in spite of the relatively clear message from the summit with the EU in December. Then after all the end of the negotiations was officially announced on the first of its kind agreement for a Deep and Comprehensive Free Trade Area with Ukraine, but it was clearly stated that moving to the next step - the agreement to be initialled and ratified - will depend entirely on the efforts which Kiev will invest. Be it because of anticipation of the outcome from the elections in neighbouring Russia or because of a desire for independent life but Ukraine did not undertake any new steps in a specific direction. The country has been standing at crossroads for quite some time now, both geopolitical and domestic political crossroads, and is refusing to decide which path to take. This is why the EU decided to step up pressure. 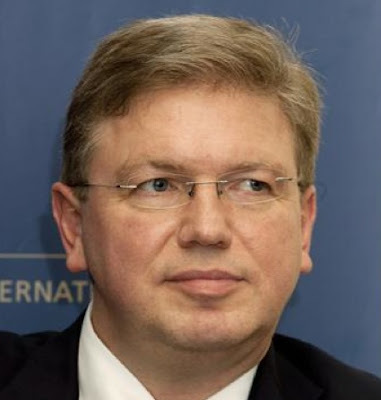 In a speech at a conference dedicated to the future of EU-Ukraine relations, organised by the European Policy Centre on February 27, EU Enlargement and Neighbourhood Policy Commissioner Stefan Fule outlined 6 steps which Ukraine had to make in order to benefit as much as possible from the European opportunities. The first step is the country to recognise the failures of its judicial system on a number of cases, among which that of former PM Yulia Tymoshenko. She was sentenced to 7 years in prison for the gas deal she concluded while still a prime minister in 2009 after the gas crisis in the beginning of that year, which left half of Europe without gas deliveries. The accusation of Tymoshenko was that she had agreed to higher gas prices to the detriment of Ukrainian national interest. The second step, which the country can undertake, is to score progress in the reform of the rule of law, which includes laws for rights of assembly and for non governmental organizations. The year will be critical, according to Commissioner Fule, because in September there will be parliamentary elections in Ukraine. The EU insists the Ukrainian authorities to invite observing missions and to take into account the recommendations of the Venice Commission for the electoral legislation. Fair access to media of all political candidates also has to be ensured, as well as to guarantee the right of assembly. A constitutional reform is going to take place this year, which Stefan Fule called to be realised in close cooperation with the Venice Commission. And if these steps are perceived by Ukraine as more or less wishful and are to be ignored, the EU will take out the financial trump card. As step number five Mr Fule pointed out that Ukraine had to undertake all necessary steps to unblock money from the EU funds. It's about 70 mn euros ($92 million) for 2011, which Ukraine could lose if it does not repair the Civil Service Law in line with the European and international standards. The money the country could lose is aimed for public administration reform. Besides, the EU could refuse the promised budgetary support for the country until all the conditions are met. This support amounts to 168 mn euros ($220 million), earmarked to support the public finances and the macro economic stability. In the end of his speech, the enlargement and neighbourhood policy commissioner said directly that it was time Ukraine's efforts to ensure market-oriented prices for its gas to bring success. "We have always supported these efforts and we are ready and willing to participate in discussions about a trilateral consortium on the Ukrainian gas transit system. Such a triangle would logically represent the producer, transit country and the consumer", Fule underlined and added that it was of essence any gas agreement with Russia to ensure full respect of Ukraine's obligations under the Energy Community Treaty. "This not only forms a key part of the Association Agreement, but is also essential for the country's future energy security and independence". EU's message is more than clear and comes just in time when another dispute started to gain force between Moscow and Kiev. As euinside recently wrote in its Free Talk Corner, during a meeting between Russian President Dmitry Medvedev and Gazprom President Alexey Miller it became clear that Russia was again suspecting Ukraine of stealing natural gas, aimed for European consumers. According to Mr Miller, in some days 40 mn cubic meters of gas were deviated. Gazprom's chief also complained that there was no mechanism for efficient control over Naftogaz Ukraine. In the end of the meeting Dmitry Medvedev orders all possible procedures for counter action to be studied. The entire conversation is put in the context of the expectations in the end of this year to start the construction of the South Stream pipeline, the main purpose of which would be to detach the Russian gas from Ukrainian transit. It is pointed out that the capacity of the pipe would be 63 bn cubic meters, almost as much is Ukraine's consumption. In a speech before the Supreme Council (Verhovna Rada), on the occasion of the new parliamentary season after the winter vacation, President Viktor Yanukovych outlines the main priorities for the country in 2012. The main focus is on domestic measures but there are several important messages which could be used for external consumption. In the very beginning of his speech Mr Yanukovych announces that in spite of the challenges and the global crisis, 2011 was successful for Ukraine as it scored economic growth of 5.2%. The main drivers of that growth, according to him, were the real economy sectors - industry, agriculture and transport. Inflation reached its lowest level since 2002 - 4.6%, credit activity of the banks has recovered, the currency is stable. The revenues in the budget grew by 31% compared to the previous year, the president also reported. What has to be improved in terms of fiscal policy, in his words, was tax administration. "I would like to address the opposition factions – please, return to the Parliament. You cannot save the country on the streets – we all know that. Therefore, it is necessary to work on developing the state, on increasing the living standards – it is a duty of all the MPs, regardless of political colours or affiliation. I sincerely wish that". In December the Block of Yulia Tymoshenko (BYT) and other opposition MPs left the Rada to protest against the sentencing of Yulia Tymoshenko. "On December 8, the government made an unprecedentedly absurd step and arrested Yulia Tymoshenko, who is already in prison, for the second time. This incident has clearly demonstrated that there is no justice in the country, but there is only a dictator and his law enforcement agencies, which are an instrument of repression. The government does not give a damn about the European values, of which it speaks. Its only aim is to destroy Tymoshenko both morally and physically", said then Andrey Kozhemyakin, the leader of BYT. As if responding to these criticisms and EU calls for reforms, Yanukovych noted before the Rada that the constitutional amendments that were to be made had to be made mainly by experts, scientists, the civil society, "and, of course, representatives of the people in the Parliament". "Constitutional process is not a one-time job for a year and it should be done openly and publicly. In addition, this work has a great educational function. Citizens should know, what kind of a state they are building", Yanukovych said philosophically and called on the MPs not to allow politicisation of the process - let's trust science and civil society. The Ukrainian president added in the same context that precisely the constitutional amendments would again "convince us of the inseparability of Ukraine and the European space. Our path to the EU has no alternatives", he concluded. According to him 2012 will also be a test because "we will finally define the legal conditions of economic cooperation with our international partners, the foundations of creating free trade areas with the European Union and the CIS countries". No matter of these reassurances, however, the foreign ministers of five EU countries published in The New York Times a letter of disappointment from Ukraine. The occasion was the fifth anniversary from the start of negotiations with Ukraine on the unprecedented Association Agreement - March 4th. The first diplomats of Sweden, Poland, Germany, Britain and the Czech Republic express their regret that instead of celebrating the signed and ratified agreement, as well as Ukraine's successful progress toward ever closer cooperation with the EU, the relations between the two sides reached the freezing point. Carl Bildt, Radek Sikorski, Guido Westerwelle, William Hague and Karel Schwarzenberg say that "the association agreement has been imprisoned, and the Ukrainian leadership is holding the key". The diplomats underscore that they remain allies of Ukraine and also that the 20 years of independence of the country have led to an irreversible change of mentality of Ukrainian society. "The people of Ukraine are Europeans and share European values. Our goal is to anchor Ukraine in the European family, as symbolised through the signing and ratification of the association agreement". The five ministers call on the Ukrainian leadership to demonstrate political courage and wisdom in achieving this. At this stage, however, as is evident from Yanukovych's statement before the Verhovna Rada, the Ukrainian leadership is trying to find the third way that would secure the country some kind of independence as from Russia, so from Europe. Because, in the end of the day, the country is forced to choose between things she wants but are not inherent for her and things she does not want but are in her blood - a choice that hardly someone would want to make.